Activists also emptied milk tankers in Solapur, Kolhapur, Nashik, Hadapsar, Buldhana, Amhednagar among many. 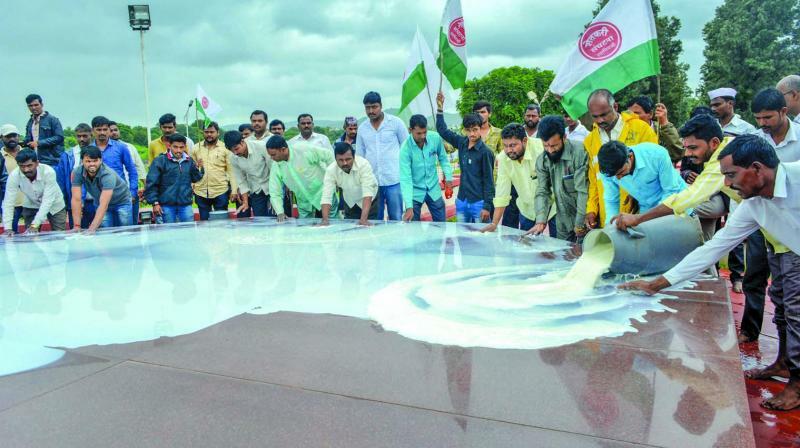 Nashik and Pune: Swabhimani Shetkari Sanghatana’s (SSS) agitation demanding a hike in milk procurement prices by Rs 5 per litre, which began on Monday, affected distribution and supply across Maharashtra as milk-collection centres and dairies refused to buy milk form milk farmers. SSS activists claimed to have stopped around 100 milk tankers from going to cities. They also emptied milk tankers and cans on roads. Sagar Londave, a youth from Mangavedha in Solapur district, bathed with 35 litres of to signify that milk is cheaper than water. He even bathed his cows with milk. Although Mumbai and other cities did not face a shortage of milk on Monday, they may face it from Tuesday. According to SSS, around 1,000 activists were detained by the police. High level of police security was put up at Sinnar tehsil of Nashik and parts of Ahmednagar district due to presence of several dairy centres. Nashik District Collector, Radhakrishnan S said that 15 milk tankers were sent to Mumbai under police protection by mid morning. No reports of stopping of tankers were received in Nashik division. “District collectors had asked dairies and farmers if they wanted protection to get their tankers to cities. Accordingly 20 tankers of milk were sent to Mumbai under police protection, said Shashikant Patle, chief of special branch police, Kolhapur. Dairy farmer Sampatrao Sonawane from Bhuse village in Niphad tehsil said that he was not able to sell milk since two days as the milk collection centres were closed. “Some farmers are trying to desiccate the milk and form ‘khava’ which is used in sweets, while others are distributing it to the villagers for free,” he added.